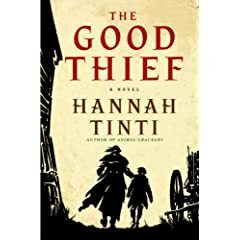 Hannah Tinti’s Good Thief is an adventure tale following the life of the one-handed and orphaned Ren. His life begins in a Catholic orphanage in New England until he’s reclaimed by his “brother” Benjamin Nab. Benjamin is a crook, a forger, and a grave robber; and much of the book explores Ren’s descent from a relatively mild-mannered and good orphan to the life of a little criminal. In case you didn’t already catch the influence from the title, The Good Thief has a complexity of moral and religious issues based upon underlying Catholic doctrine. I’ve been rewriting this review for more than a week now because it’s an okay book, a good story, and a pleasant experience. However, I wasn’t thrilled with it. After completing The Good Thief, I saw a write up of it in Entertainment Weekly, I believe, but even there I don’t recall much of an opinion from them either. Reading it so close to the heels of Mercedes Lackey’s Foundation I found some parallels. It’s a text that runs smoothly and is easily read. There are allegorical qualities to the book that perhaps a more knowledgeable Catholic may perceive. Overall though it was not a book I was particularly excited about. I was somewhat surprised to discover at the unboxing that The Good Thief is listed as adult fiction. Though the book has the briefest dabble in sexual innuendo and certainly explores violence, it really isn’t questionable material. Tinti’s piece is compared to the classical works of Robert Louis Stevenson, which was originally adult fiction but thanks to the many incarnations of the children’s adaptation and Disney, it’s very much a children’s classic. Conclusion: Giving away at Bookmooch. I’ve recently seen this one around and it looks really good! I don’t bookmooch (too lazy), but I’ll definitely have to keep my eye open for this one!